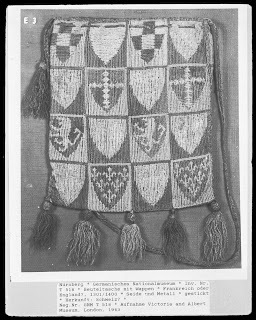 Medieval Silkwork: 14th century heraldic pouches: what type of stitch is this? 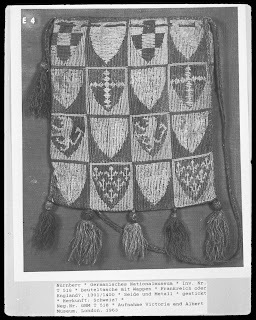 14th century heraldic pouches: what type of stitch is this? 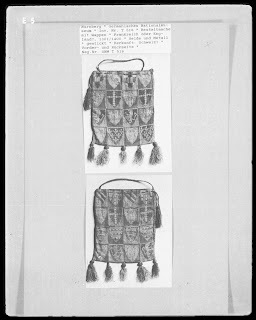 Racaire just posted a picture of a 14th century heraldic pouch on her blog. It reminded me of these images from the Bildindex I downloaded some time ago. Does anyone know what type of stitch is used here? I have no idea, and I even thought of knitting, but that's probably not true.. We would love to hear your ideas on this! Looks like knitting to me. Some of it is horizontal - that's an interesting effect. Shouldn't be *too* hard to do, once you get the figures copied... Now that sounds like a fun project! 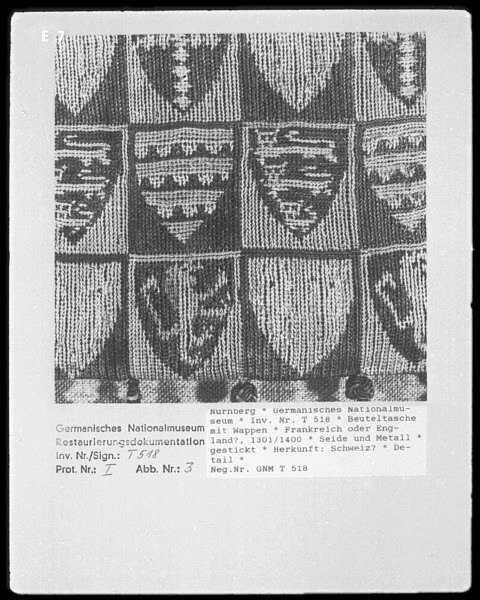 If it is indeed embroidered, my guess would be some variety of tent stitch (see Stitch Guide: Tent Stitch ). But it is very difficult to tell from the pictures..
...but yes, knitting is also a possibility. Museum curators don't always get everything right, after all.. It looks like knitting to me, too. I remember seeing a color picture of a knitted pouch but I can't remember where. Where the squares meet it looks like they have been joined together, I don't think it would look that way if it was embroidered. Maybe some kind of chain stitch would make a similar effect in embroidery? 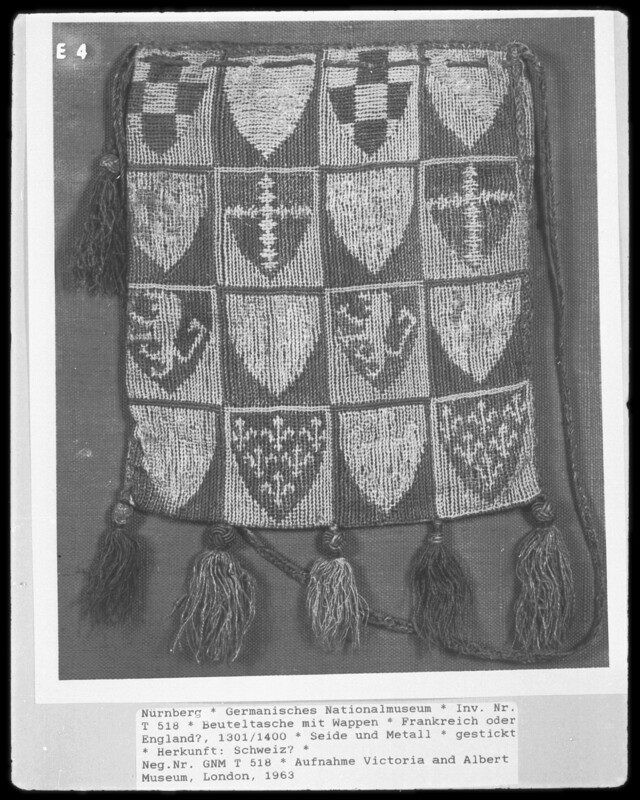 I suppose it might be chain stitch but the photos are not good enough to tell for certain. It really could be anything. My best guess would be a form of knitting, as you mentioned. The pattern of the stitch looks like a series of interlocking chain stitches, which is the simplest and most basic of the knitting-family of stitches. The trick would be to learn the history of knitting (and its forms) to find out what pre-dated our modern idea of it and see if that technique fits the era. the ceylon or loop stitch? I would certainly suspect long-armed cross stitch above all. This stitch looks a whole lot like knitting at first glance, except that it changes direction through right angles -- something rather difficult to do and not at all typical of the knitting style of the time. 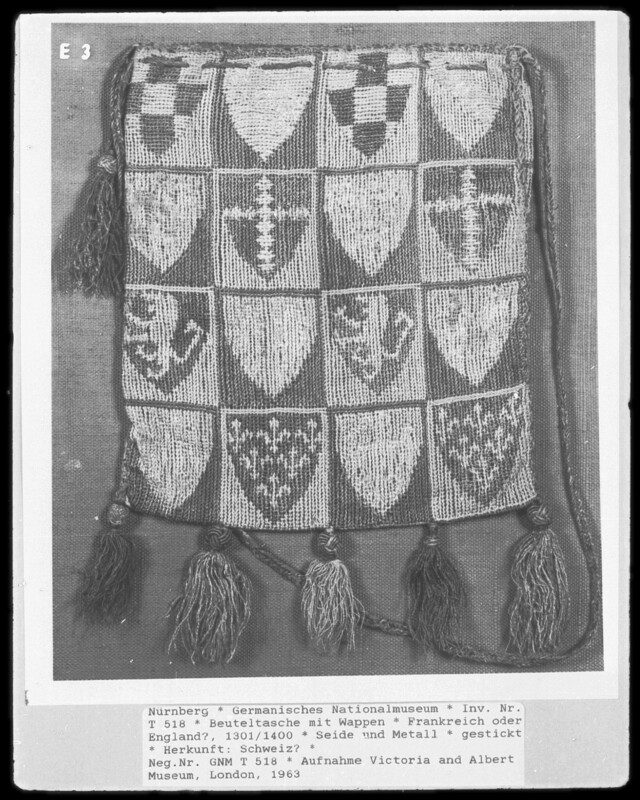 Of course you can see it's embroidery right away if you look at the back. 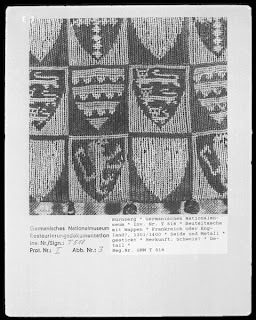 There is an embroidered pillow cover from Las Huelgas -- not as well known as the two famous knitted ones -- that is done in long-armed cross stitch and there are close-up photos that show the stitches turning corners. 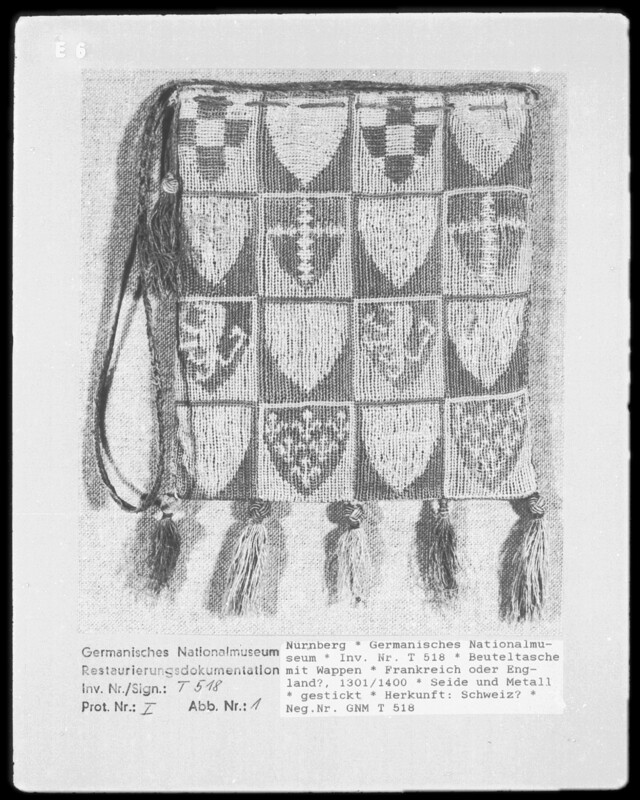 That one is not heraldic, but it's in a similar "checkerboard" style. Sorry folks but you're all wrong. Think simpler. It is just a simple petitepoint stitch. One row leans right, the next row leans left giving the appearance of chain stitch or knitting. It can easily run north and south or east. It can be done as just a half cross stitch with 6 stands of floss. The stitch is very small and done with thread that is much thicker than the threads in the ground fabric. I'll take more pictures of it when I go there next time. I live close to the museum. 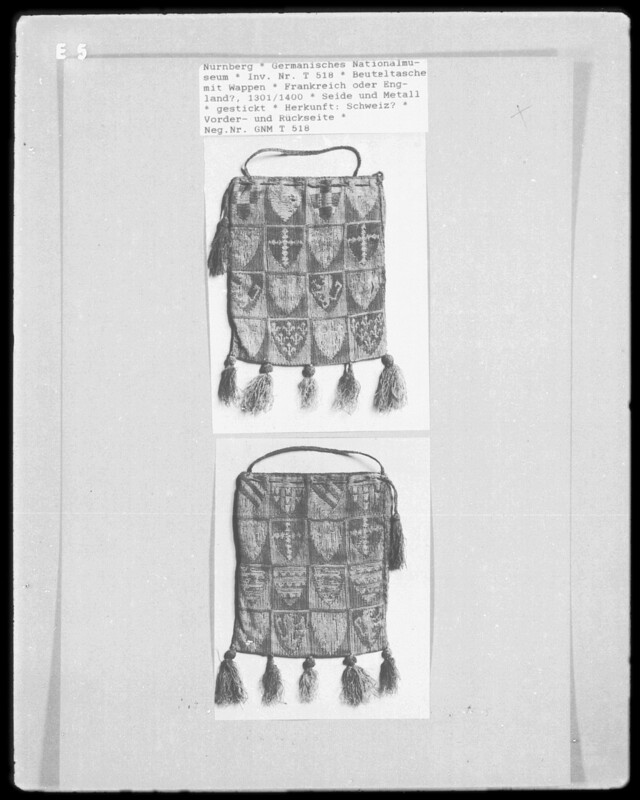 It looks like the embroidered cushions (formerly considered the first european knitting) from the Huelgas tombs See website monasteria Maria las Huelgas at Burgos, the menu ' restauration' there is a PDF of the restauration. 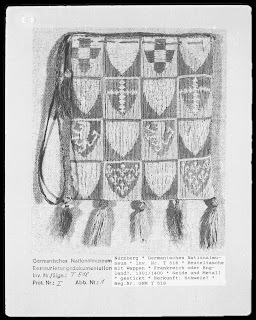 The stitch is comparable with the coptic stitch known from nalbinding. It looks like a chain stitch, but it goes around the loop, not through it. This stitch is marvellous used in 3rd century peruvian embroidery, mantles mainly, really amazing. I think a museum in Boston has good pictures of it. The resulting fabric looks a bit like too hot washed knitting, a kind of 'tired' tricot. The coptic stitch it a kind of buttonhole stitch, connected with the former row of stitches by not going through the loop, but around the crossing threads of the former row. As you finish a complete stitch, not in two rows as in knitting, colour patterns are much easier than with knitting. Embroidery on a cloth painted with water olours as a pattern is technically possible.the stitches can be made very fine. Hope you find this info useful.